Much of the fun of gardening comes in the form of surprises. Just when you think a plant is about to expire, it pops back to life--just when you think your mystery flower will never bloom, it does. Make way for the ghost lily--the grand master of gardening mystery and landscaping surprise! Yes, you can buy the bulbs of ghost lilies from your local garden center or order online, but the suggested method of procuring your start of ghost lilies is to obtain them from a gardening friend (that’s how we got a start). Plant the bulbs deep (8 to 10 inches or more) and incorporate lots of organic matter into your planting site. A layer of mulch on top always adds to the neatness of your garden and helps hold moisture and prevent the growth of weeds. 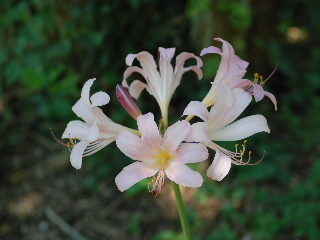 The next step is to go on about the business of tending to other parts of your garden and forget about your ghost lily plantings--they’ll remind you of their presence when it’s time. And that reminder will come in the spring as the soil starts to warm. A nice cluster of lush green leaves will emerge and head upward (at a rapid rate). You smile in approval at their full and hardy burst into your garden scene, and you chuckle in gleeful anticipation as you visualize the beautiful and graceful blooms your ghost lilies will soon provide for you. Time passes and your flowering smile turns to a withering frown as the lush green leaves begin to wither and turn brown--and no flowers have appeared! What did you do wrong? What was wrong with the bulbs or with your planting method or with the site you chose? And the answer is---nothing. This is the way ghost lily behaves. Lots of beautiful greenery that appears and then disappears (kind of like a ghost!). And then, wouldn’t you know it? After you’ve given up all thoughts of flowering lilies, and after spring has turned to summer--you notice stalks shooting up where leaves used to be. 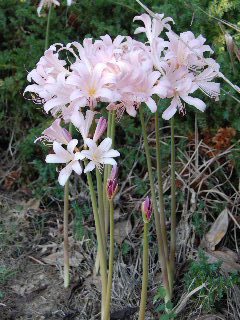 The stalks, which grow almost as rapidly as the leaves did, resemble the bloom stalks of amaryllis. And, these towering stalks will provide you with the much desired blooms of the elusive ghost lilies that you had dreamed of--beautiful blossoms which also resemble the blossoms of amaryllis, but with a more delicate and wispy appearance (kind of like a ghost!). Now the ghost lily has completed its seasonal cycle--from nothing, to leaves, to nothing, to stalk, and then to blooms. The master of mystery and surprise--the ghost lily!